I have been most honored to be a part of an exhibit in Denver at the Republic Plaza. 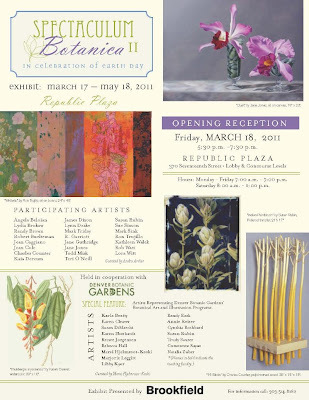 It will be up until mid-May, so if you are in the neighborhood, you might want to pop in and see it. I have not been there yet, but hope to go in May. I understand that the art is wonderful (there are several exhibits in the space). I went out and gave the garden a closer look. The white grape hyacinths are up as are my namesake flower: "Hi ya, Cynth! "....and more daffodils are getting ready to pop. We took away the mulch from the Hydrangeas and I do believe that they made it through the Winter months. The Japanese Maple also survived, which we are delighted to see. It was so tiny when we put it in last Fall that I am just glad that it survived. We are hitting the road again.... so I hope to bring you pretty photos from across the country. There are many wonderful things about my husband's retirement, but time management on my part has been quite lacking. As a result, this blog has taken a back seat to the voyage that I am taking, at the moment. Whew, it hasn't been dull, that is for sure. No work.... I mean NO art work is getting done right now. I am hoping that I will have more time for it, at some point. I am going to take my 'crayons' with me from now on and try to sketch (or something) much more often. I also lost my beloved bifocals, and I am desperately trying to focus without them. It's not good. I am looking for the humor in all this....well, a meltdown or two was in order, but mostly it has been non-stop fun for the past few months. I miss my blogging buddies, for sure. Okay.... the garden is barely blooming. It's been drier than dust in Colorado, so I have one (that's it...just one...) daffodil, and some crocus that are blooming. Ouch.... it's not my pretty garden right now. We are watering it a bit, in hopes of luring the tulips to bloom. I wanted to share some highlights of Maui. It really was beautiful and warm and sunny. The Tsunami did some damage on the island...but it was cleaned up within a few days...and you cannot see any of it now. Also, the currents in the waters of Japan, draw the water away from the islands , so there is no danger of radiation problems on the islands. I certainly do not want people thinking that it is not a place to be right now... as it certainly still the paradise that you have heard about or seen previously. The northern most part of the island of Maui. This is the first time that I have seen a Bromeliad blooming. so the waves were really kicking up. That is the island of Molokai in the distance. These Plumeria were in full bloom. I had some photos for you but this computer is confusing to me and, at the moment, I am unable to download photos. Mostly, I would be showing you....again..... a large parking lot, filled with cars, with people in them, sleeping or waiting for the wave to come in at 4 a.m..
We took our pillows and headed up the hill, about a mile away. This time, the alarm went off at 10:30 p.m., right out side our window..... and the wave was expected to come in around 4:00 a.m. We packed up (we are getting to know this drill, which is a little scary) and added our pillows, as we knew it would be a long night. I must admit, it's been a while since I had to sleep in my car... and it has given me a new perspective of what many people are having to do these days. Believe me, it was not so comfortable, but there were many around us who were in the same situation. So we got comfy and drifted off to sleep...between news reports on the local radio. After the first wave, it was determined that the second, third or fourth would be bigger. Such was the case..... the third wave was the one that caused the most damage. We were able to come home around 11:30 in the morning. As we went to visit our favorite tide pool today, I realized that this would have been totally covered with water and we could have been just sitting there watching the sea urchins, etc. Thank heavens for the wonderful system that the islands of Hawaii have set up for safety during a Tsunami. Though, it is quite an inconvenience, it is the best thing ever, for the safety and welfare of the citizens and visitors. I honor the ocean, the aloha spirit, and the great civil servants, that worked through the night, caring for those of us who wouldn't know what to do, otherwise. So, Aloha..... I hope to figure out the photo situation...and share some pix with you soon. I pulled up these photos from Florida - a happy reminder of the beach and the warm sun. I found this quote on a painted board, for sale in a store... and I loved it. Isn't that just the perfect thought on a cloudy, windy, cold late Winter day. It works for me. I find these so beautiful. Here is the second in the series of Oak leaves....on it's way to completion. I have finished it up, but have not taken another photo. I just thought you might enjoy, comparing the two pieces. Before I left on vacation, I had completed this mixed media (water color and colored pencil) drawing. Some days I love it and others, I don't .....so you can be the judge. I worked on a painting today... and it ended up looking worse than when I started..... just think I should throw that one away and start over. So, I did! I changed the subject and tried something brand new.... in another color..... in colored pencil (always seems to build my confidence a little). I will let you know how it goes. I have another completed work....similar to the one below..... that I will show tomorrow. We took off for warmer climates and found them in great supply. What we did not find was an easy place to use the computer and keep in touch with all of you. Maybe, that was a good thing. Some times, it is necessary to step away from everything and just find that calm place to relax. It was wonderful to not be on a schedule and working in the studio. One of the very interesting things that I discovered on this trip was fog. Check out the photo below....can you even tell where we are? We were on the beach, walking with hundreds of other people, but you could hardly see them. We were covered in a light mist and it was amazing. I just loved it. Believe it or not.... there is a large body of water out there. Sea grape lines the board walk on the way to the beach. Eventually, the sun came out..... ah, paradise! I took a break from work, choosing to focus on relaxation and transition with my sweet hubby. There are moments in time, when it is important to refocus, relax and renew....and that is what I did. Tomorrow, I will share work that is in progress, here on the Front Range of Colorado.